What kind(s) of climbing do you plan on doing most often? This will help you decide what features are the most important. 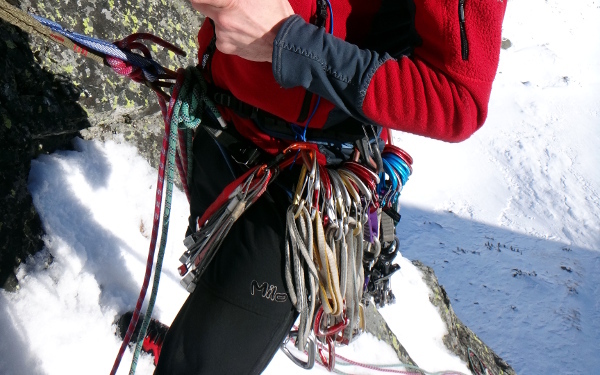 All-round - These are also known as all-around, crag or sport harnesses. Ideal for beginners, they are designed to function well in a number of climbing applications such as top-roping, sport and gym climbing. Most have padded leg loops and waistbelts for maximum comfort when working a route or taking a fall. Detachable leg loops let you answer calls of nature without untying from the rope. Most models also feature convenient gear racking loops for easy access to hardware or chalk bag without the need for a shoulder sling. These harnesses typically feature a dedicated front loop so you can easily attach a belay/rappel device. Alpine - Designed for long mountain trips, these harnesses typically feature minimal padding and features in order to save weight and bulk. Non-absorbent materials are used to withstand the rough weather often encountered in glacier and alpine climbing. Highly adjustable waistbelt and leg loops allow for clothing changes between pre-dawn chill and afternoon sunshine. Leg loops are usually detachable so you can take toilet breaks while staying tied into the rope at the waist. 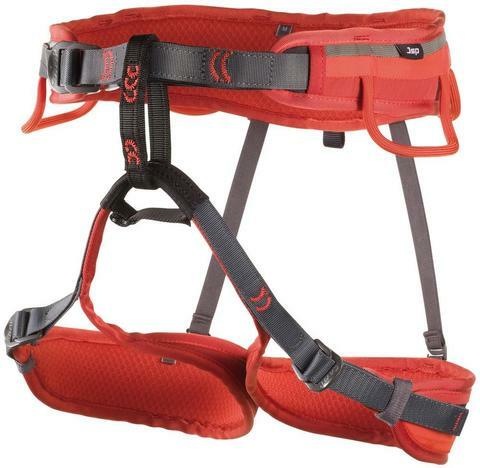 Big Wall - These harnesses are used by climbers doing multi-pitch, multi-day climbs such as those in Yosemite Valley. They feature lots of padding on the waistbelt and leg loops to relieve pressure during hanging belays or aid climbing. Multiple gear loops allow handy on-harness and take some of the weight off your shoulder gear sling. They usually feature a full-strength haul loop in back for towing a rope or heavy gear bag. 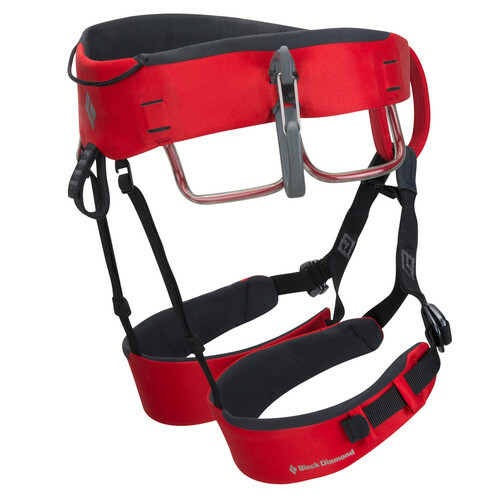 How to check if harness is good for you? 1. Try on the harness over the bulkiest clothing layers you might wear while mountaineering. This should include your shell jacket and snow pants. Make sure that the waist belt sits above the crest of your hip bones and can cinch down tightly enough that you can slide your hand between the harness and your waist but don't have room to turn your hand around. 2. Perform the same fit test for the leg loops: When they are cinched down you should be able to slip your hand between the loop and your thigh, but you shouldn't have room to turn your hand around. 3. Put on your mountaineering boots and crampons, if you have them, and try taking the harness off and putting it back on over the extra footwear. Both leg loops and waist belt should adjust sufficiently to allow this without a struggle. 4. Take the harness off, strip down to the lightest layers you think you might wear while mountaineering, put the harness on again, and perform both fit tests---waist belt and leg loops---again. If the harness you're trying on cannot be adjusted to fit you both in bulky layers and stripped-down layers, it's not suitable for mountaineering. 5. 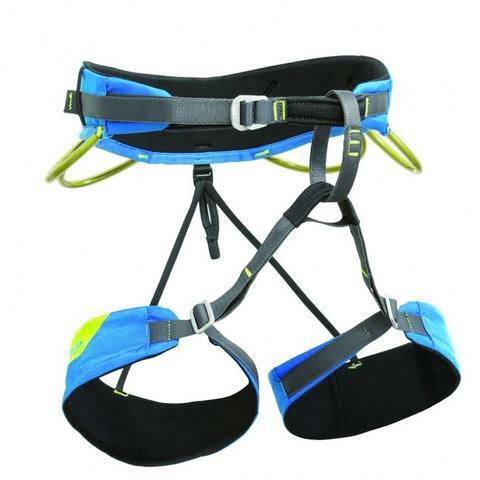 Inspect the harness to make sure that the leg loops are detachable (there will be a small clip joining each leg loop to the waist belt, via a piece of elastic webbing) and that the material is non-absorbent; these are important elements in a mountaineering harness. Even though comfort is a secondary consideration for mountaineering harnesses, you should still tie in to the harness and perform a "hang test" if the shop's facilities allow it. This involves suspending your full weight from a climbing rope, while wearing the harness, to make sure that it fits comfortably enough to permit you to sit for at least short periods of time. If the harness bites into your skin anywhere or pinches you uncomfortably you won't be able to bear sitting in it for any length of time; try to find a different harness that is not so uncomfortable. Differences between a $45 harness and an $75 harness may be difficult to see. You do not need to pay many to get a safe harness. However, harnesses are tough and should last a while, so durability is often the difference between expensive and moderately-priced harnesses. Consider that you may be climbing in this thing for a few years before jumping at that small price tag.